Imogen's Typewriter. : Fiction Friday: Too Spooky Reads! Happy Halloween! Today I've got a list of some too spooky (or too spoopy) reads that I'll be picking from to read tonight and tomorrow as part of my Halloween Read-A-Thon! 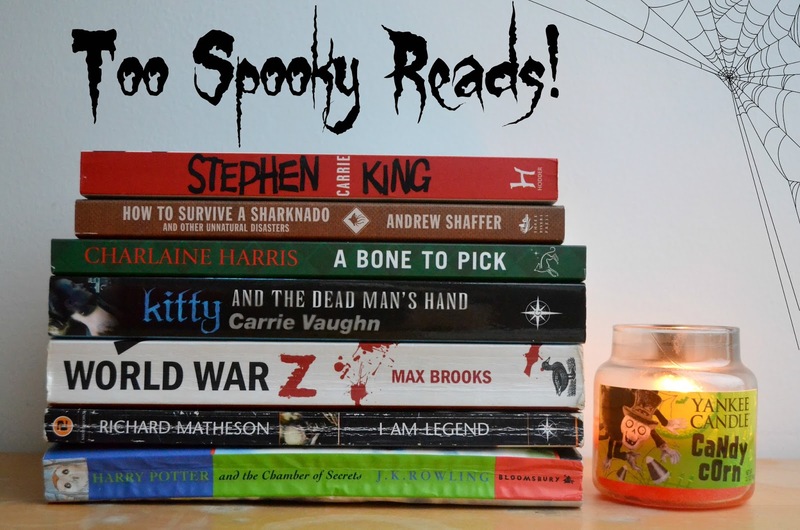 Halloween is a great night to get some scary reading done and there is still time to join the #hallowreadathon if you want to join me and a few others in reading and scaring our socks off! But on with the list! So the books I'm debating between this halloween are; Carrie by Stephen King . I haven't read this book in a couple years but I remember loving it when I was a teen. It was the first Stephen King I owned and started my love of his writing and my collection of his work. It's a creepy tale of why you should never pour pigs blood on someone at prom. Just don't do it. How to Survive a Sharknado and Other Unnatural Disasters by Andrew Shaffer . This came in my October Loot Crate and I'm dying to start it. It has everything you could possibly want to survive; Sharknados, a Beeclipse, Swamp Volcanos, Bigfoot, you name it. I'm a big fan of the Worst Case Scenarios books so this is right up my alley. It's a pretty short book too so I don't think it'll take too long to read. A Bone to Pick by Charlaine Harris . I loved the first book in this series and gave it five stars, so while it may not be spooky, I think it still belongs on the list as it is a murder mystery type book and when it a better time to lose yourself in one of those then halloween? Kitty and the Dead Man's Hand by Carrie Vaughn . This series has had a lot of attention from me this month and rightly so. Werewolves? Check. Vampires? Check. Action? Check. Drama? Check. I've been loving these books and I'm so ready to jump into this, the fifth book in the series. I really recommend these books if you're looking for a good urban werewolf story and look out for my reviews of the third and fourth book coming soon in my monthly wrap-up. Maybe this will join them! World War Z: An Oral History of the Zombie War by Max Brooks . Yes, I'm talking about this book again and again and again on my blog but it is one of my firm favourites and deserves a spot on this list. In the format of interviews with survivors, the narrator takes us through the zombie war with chills and paranoia along the way. I don't think I've read this book once without feeling the urge to move to somewhere remote and learn how to wield a machete. Love it. I am Legend by Richard Matheson. Another favourite if the battered spine didn't show that. I have a vivid memory of buying this book in Manchester Waterstone's and reading it in a shoe shop while my mum bought shoes, I was hooked from the first page and it deserves all the credit it gets as the origin of the modern zombie. And yes I've talked about it before on the blog and even bought a copy to give away. Harry Potter and the Chamber of Secrets by J.K. Rowling. We all need a little magic, right? I think my most frequent costume when I was a kid was a witch so it only seemed right that ol' Harry made it on the list. I'm currently reading this with a friend of mine who has never read Harry Potter before and she's taking part in the Read-A-Thon so we're going to blast through some of this tonight.